PHOENIX - There's new information surrounding a missing child's father. Logan McQueary is back in trouble with the law. McQueary is the father of Gabriel Johnson, a boy who went missing in 2009. PHOENIX - The father of an Arizona baby who disappeared after his mother fled to Texas is turning himself in on a stolen goods charge and will be available to testify against another woman accused of interfering with his custody rights. Logan McQueary has agreed to face a stolen goods trafficking charge and be available to testify next week, Maricopa County Attorney's Office spokesman Jerry Cobb told the Arizona Republic Thursday. I just saw on In Session that the trial will be broadcast starting next Tuesday, April 17, 2012 at 1:30 PM.. Thanks for the info, Estee! Estee wrote: I just saw on In Session that the trial will be broadcast starting next Tuesday, April 17, 2012 at 1:30 PM..
Is this 1:30 AZ time? What is the difference in AZ time and NC time? AZ would be 2 hours behind NC. Thanks Julie, you are a sweetheart. It could be a very interesting week in the so-called "Baby Gabriel" case. All of the key players in the national investigation are involved in significant events happening in the Valley this week. Gabriel Johnson was last seen the day after Christmas in 2009. His mom, Elizabeth Johnson , took the boy from Tempe to San Antonio where the boy vanished. Trial to be aired Live on TruTv-InSession starting Tuesday, 4-17-12, at 1:30 p.m. EDT. In Session will air the trial live on the truTV network. In Session on truTV will air an exclusive interview with Baby Gabriel’s father Tuesday at Noon ET. Opening statements in Arizona v. Smith are scheduled to begin Tuesday at 1:30 p.m. ET. CNN.com Live is streaming the trial. You need Flash to watch it. Court is not in session; lunch! After lunch, Logan McQueary, Baby Gabriel's father, will be the first to testify per Vinnie Politan (InSession). Note: Having problems direct linking at this time. To the right of the video box, click on the Baby Gabriel Live Stream if the Link above does not take you directly to the Baby Gabriel stream. KPHO (CBS) is Live Streaming the trial also. I like to have a back up in case I lose sound or whatever with CNN. It is the raw feed from InSession. Judge McMurdie told the jurors to be on the 6th floor tomorrow (Wednesday) at 10:25 a.m (MST) and when they were ready for them, some one would come and get them. Some Arizona media are reporting that the trial resumes at 10:30 a.m. MST on Wednesday. It would be 12:30 p.m. CDT; 1:30 p.m. EDT. InSession on TruTV (television) is streaming live; CNN.comLive is streaming and KPHO - Phoenix, AZ is streaming. I noticed today CNN cut their Live Stream late this afternoon. I assume because they are on Eastern time. However, KPHO in Phoenix Live Streamed until the court was recessed for the day. I had windows open for CNN Live and KPHO with the volume turned off on KPHO. When CNN cut away, I immediately clicked on my open KPHO window and did not miss any of the trial. The Defense said Tammi Smith will testify. It should be interesting to hear that "mouth piece" testify! Today I noticed Tammi smirked and made several facial expressions. She needs to get rid of her "attitude." That woman really turns me off. At times she took notes and when the camera zoomed in on her, she had a huge, huge ring on. Black. Looked like some type of costume jewelry. Tammi is sporting a new look. She has lost lots of weight and has jet black hair now. Logan McQueary was the first witness to testify. He came across as credible. Finally, getting to know the facts in this case and what happened prior to the disappearance of Baby Gabriel. Interesting trial. Logan McQueary resumes testimony on Wednesday! Tammi and Jack Smith never met Logan McQueary before they began barraging him with phone calls and e-mails and offered him $1,000 to sign over his parental rights to his son, Baby Gabriel, McQueary testified on the first day of Tammi Smith's trial. Tammi, the woman who wanted to adopt Gabriel, and her husband, Jack, told McQueary that if he signed the papers, Gabriel would return safely to Arizona, McQueary testified. Tammi, 40, of Scottsdale, is charged with forgery and conspiracy to commit custodial interference with Gabriel's mother, Elizabeth Johnson. PHOENIX -- The woman who wanted to adopt missing baby Gabriel Johnson in the weeks before his disappearance is on trial. Prosecutors say 40-year-old Tammi Smith of Phoenix forged adoption papers, and committed custodial interference in December of 2009. 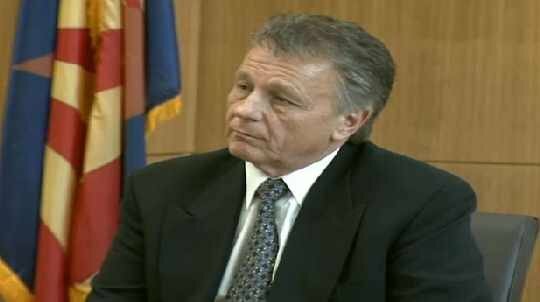 Here is the Link to KPHO - AZ Live Stream of the Tammi Smith trial. Unlike CNN, they streamed the trial yesterday until court was adjourned for the day. InSession (TruTV) is also covering this trial live on television. Vinnie Politan is currently the host. CNN.com Live - "Baby Gabriel"
At lunch. Will be back in session at 1:30 p.m. MST. Trial will adjourn for the day at 3 p.m. MST today and will resume tomorrow (Thursday) at 10:30 a.m. MST. Tammi Smith appeared to get a little emotional sitting in Superior court Wednesday, as she listened to a recorded phone conversation she had back in 2009 with Logan Mcqueary, the father of baby Gabriel, the 8-month old boy that Smith was hoping to adopt. PHOENIX -- It was a startling and emotional day in the criminal prosecution of Scottsdale resident Tammi Smith. Smith is the 40-year old woman accused of playing a role in the 2009 disappearance of 8-month-old Gabriel Johnson. PHOENIX - More testimony in the trial of Tammi Smith. Thursday, her cousin took the stand. Craig Cherry’s name ended up on legal documents listed as baby Gabriel’s father. PHOENIX -- Day three in the high-profile criminal trial of Scottsdale resident Tammi Smith saw prosecutors building their case against the 40-year-old wife and mother. Smith is charged with forgery and conspiracy to commit custodial interference for her alleged role in the disappearance of 8-month-old Gabriel Johnson in December of 2009. Per InSession (TruTV), no Tammi Smith trial today. That court is in session Monday thru Thursday only. which is 12:30 p.m. CDT/ 1:30 p.m. EDT. The judge said there will be 4 trial days next week (Monday thru Thursday). He asked the Prosecution about the status of when they might rest their case. The Prosecution told the judge the name of the witnesses scheduled to testify next week. One is a police officer and the others are detectives. I think they named 5 detectives. The Prosecutor told the judge that Detective Ramirez (might be misspelled) will take quite some time. The State might rest on Wednesday or Thursday. If so, the Defense will present their case on Thursday. The judge told the Prosecution and Defense to do a "dry run" on everything they plan to publish. He wants to make sure everything is working and there are no delays in the trial. If you've watched the trial, you know that the Prosecution had problems with playing back recordings, etc. Last week the judge told the jury there is new technology in the court room and he apologized to them for having to wait while the attorneys tried to get things to work. During Thursday's testimony, Tammi Smith continued to smirk, make facial expressions and at times I think she smiled at inappropriate times. Oh, she wore a black gaudy ring Thursday. Huge. Inappropriate for a court room, especially since she is the Defendant. PHOENIX -- There was some interesting testimony on Wednesday in the trial for Tammi Smith. She is the woman who wanted to adopt Baby Gabriel Johnson before he disappeared two years ago. Note: To the right of this article, you can click on and read previous articles (Related). Watch the video to see In Session's Jean Casarez discuss what happened to Baby Gabriel with crime blogger Levi Page. Frantic phone calls to Tempe police, MySpace posts offering to finance a surrogate's baby, a father's e-mail begging his ex-girlfriend to let him raise their son. 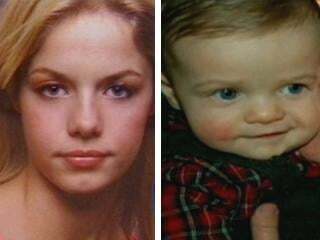 These were but a few of the virtual missives that flew back and forth between the principals in the Baby Gabriel case: The baby's mother, Elizabeth Johnson, 25; his father, Logan McQueary, 27; and Tammi Smith, 40, the Scottsdale mother who appeared desperate to adopt the baby who vanished in 2009. As the trial entered Week 3, prosecutors presented texts, e-mails, voice messages and MySpace posts apparently showing that Smith and Johnson were in frequent contact before and after Johnson fled with Gabriel to San Antonio, the last place the baby was seen alive. PHOENIX - It’s day 11 of the trial of Tammi Smith. She’s the woman accused of forgery and custodial interference in the case of missing baby Gabriel. There were some dramatic new developments Monday. Prosecutors played recordings from when Tempe Police initially interviewed Tammi Smith as a person of interest in the baby's disappearance. PHOENIX - Tammi Smith cried in court Monday as she listened to a two-hour taped interview between her and a Tempe police detective regarding the case of missing baby Gabriel. At one point, lead detective Patricia Ramirez seemed to catch Smith in a lie when Ramirez asked Smith if she ever forged a court document in an attempt to adopt Gabriel Johnson, the baby boy who disappeared in December of 2009. I posted the following Links on The Hinky Meter. I do not have time to post these articles here at this time. Maybe later in the week, I will have time to post and embed the FOX article and video. Wow! This was uncovered by AZFamily (3TV). It happened in 2002. The baby did survive. The baby was turned over to Child Protective Services. He was eventually adopted but not to Tammi Smith or anyone else in the family. Valhall of The Hinky Meter started a thread for the Tammi Smith trial on Wednesday, 5-9-12, in anticipation of Tammi Smith's testimony. Freckles did an outstanding job of providing info about the testimony in real time. Others also provided info. Jack Smith was the first to testify for the Defense yesterday (Wed., 5-9-12) and late in the day Tammi Smith was called to the stand. Video with the article shows snippets of Tammi testifying. Also, a snippet of Tammi and Jack when they did an interview as this case unfolded. You can see what Tammi looked like back then compared to today! It is at about the :42 mark. I bet it pizzed Tammi off that during the flight from Indianapolis, Elizabeth Johnson sat in First Class and Tammi was in coach. LMAO Tammi and Jack seem to think they are so much "above" Elizabeth and Logan McQueary. I posted the following at The Hinky Meter by Valhall. Informative article and video. Smith testifed about her born-again Christian religion, her abusive childhood, her training as a colon hydrotherapist and her one-time aspiration to be a country and gospel singer, like her husband, Jack, whom she met in Tennessee and who also testified Wednesday. Tammi Smith wipes a tear away Wednesday during testimony on her own behalf at her Baby Gabriel-related trial. Snippets of Tammi testifying in the video. New details emerged from Superior Court Thursday in the trial of Tammi Smith. Smith is the would-be-adoptive mom accused of playing a role in the disappearance of baby Gabriel, the Valley toddler who's been missing since December 2009. The Scottsdale woman took the witness stand in her own defense for the second day in a row. "I wanted to believe the baby was alive," Smith told jurors. "I wanted to believe with all my heart that there's no way I held a baby that somebody killed." Scottsdale woman took the stand to defend herself for her involvement in the Baby Gabriel case. Tammi Smith faced a line of questioning Thursday about the paperwork that helped put her on trial in the first place. Smith is accused of lying on a court document in a plan to try and adopt Baby Gabriel without his father’s permission. Valhall is allowing the former Hinky members to use Ventrilo - Live Chat during the duration of the Tammi Smith trial. Of course, as indicated prior to THM being shut down, Valhall expects us to follow the rules regarding Ventrilo - Live Chat and I know we will all do that. If not, chickenbutts aka EDRN, will set us straight. If you need any help regarding Ventrilo, chickenbutts is tech savvy! I think it is very nice of Valhall to allow us to use Ventrilo. Special thanks to you, Val! We really do appreciate it. I will certainly try to be there Monday. I'm feeling not quite so lost without HM since many of you are here. I will miss Val very much though. I hope she joins us and posts her thoughts. It might be more enjoyable for her without the responsibility of the HM. I am thankful as well for the opportunity to use Ventrilo. Shortly before the trial starts, the stream will be made available and you can click on. After the video box is available, we usually post the Direct link to the Live Stream. You can click on the box that will say: "Baby Gabriel . . . "
Valhall is so kindly allowing us to use her Ventrilo - Live Chat (with Audio) as we have been. We can use it through the duration of the Tammi Smith trial. I just checked and it works as before! You do not need a mic to type in the Live Chat. Only if you want to talk. You will be able to hear others talk whether you have a mic or not. Valhall expects us to continue to follow her rules for the Ventrilo - Live Chat and especially not talking during trial testimony. The Ventrilo is open and you can go there any time prior to trial. I have a lot of things going on tomorrow but I hope to be on Ventrilo. See you there! I would rather not post minute by minute on this case.I will be watching it, however. Is there anyone who needs the minute by minute posting? Anyone following it this AM? Freckles wrote: I would rather not post minute by minute on this case.I will be watching it, however. Is there anyone who needs the minute by minute posting? Anyone following it this AM? Hi, Freckles and Weezie! So glad to see you! A very warm welcome to RC! Freckles, I don't think I'd post minute by minute. The former Hinksters are spread out at different sites. I know it is one heck of a job to do the minute by minute like you did at THM. Wow! You must type 150 wpm! There are many that don't even know we have a thread here and I think it would be senseless to type all of that and perhaps no one would be checking here for updates. Thank you so much for the awesome job you did at THM last week. I was just getting ready to click on and read your minute by minute because I missed some of the trial. The site just shut down. Should be an interesting trial day today! If yaul are not going to be on Ventrilo please comment here during the trial. Like we did at THM! Hhmmm, I don't know what Julie's schedule is but if she is available, she might even take yaul to Live Chat here at RC. Now that would be cool! It is a lot of fun.